First book to be reviewed in 2013 and Flora Nwapa's second novel I have read so far. In order to read my first review of her novel please click here. 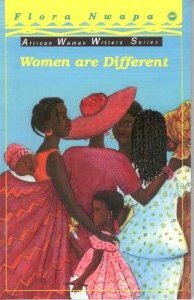 Women are Different is about Agnes, Dora, Rose and perhaps Comfort with different background. They met when they were teenagers in an entrance examination to high school in 1945, Nigeria. Eventually, they passed and were all admitted to girls boarding school. A British missionary was the school principal. She was determined to raise them in the Christian way and prepare them for the fast approaching "ill-considered" independent Nigeria. Life in boarding school was fun, full of dreams and hope for the future, romance novels were clandestinely read. They met boys; fell in love and talked about how beautiful life would be with them. After many years of swotting for exams, they finally passed and graduated from high school to face the real world. To start with, Agnes was forced to marry a man she loathed. Even so, she gave birth to four children or so, whereupon, her marriage finally fell to the ground, so she decided to start life afresh on her own with her children. Next, Dora happily married Chris, her high school love and bore him four children there around. Afterwards, Chris had to travel abroad to forward his studies but he never returned. It was later learnt that he was in a relationship with a German lady in Hamburg. Rose's high school love just vanished into thin air. Thereafter, she only came across men who duped and jilted her, she was catching-up the age of forty-two without a husband and children. In fact, her personal life was nothing to be proud of in those days. Nonetheless, her professional life was thriving. Finally, Comfort, she was always there to give her opinion. These women were struggling against all odds to change their plight in the midst of Nigeria that got her independence in October 1960. No sooner had January 15th coup of 1966 occurred than it became restive, followed by a civil war that started in 1967 and ended in 1970. At a point, considering what has become of their lives, they wondered whether the British missionary really prepared them to exist in such a society. I enjoyed this novel, it is an insight into the life of women in Nigeria between the 50s and the 70s. I recommend it to everyone (adults especially). Flora Nwapa writes inspiring stories about women. Even though, "Women are Different" is a novel I took so much pleasure in reading, I have to admit that there were few grammatical errors detected. However, it would not diminish your relish for reading. Five stars read indeed. This sounds like a wonderful and fascinating novel. I have never read any of Flora Nwapa's works, though I have come across a few like Efuru. Thanks for sharing, Mary. Celestine, it was a great read indeed. The first two chapters perhaps a bit slow, however it is fascinating to see how those little girls grew into women. I recommend. Thanks for stopping by. As a matter of fact an Australian Blogger site inspired me to start my own blog, I am not sure if you have heard of it http://messybooker.blogspot.com.es/ The world is a very small place indeed. I am checking out your site right away and would be following as well.